Three Cuts: Johan Camargo altered perceived need at third, but will he change Braves’ future plans as well? And we've seen the last of the consecutive series the Braves have against teams with losing records. Atlanta did what it needed to against the Marlins and Mets, two teams who are in a race to the bottom of the National League, winning five out of six. But business is about to pick up with a four-game series on the road with the Nationals -- winners of seven of their last 10 -- before meeting the Wild Card-leading Brewers at their place. What lies ahead in D.C. stands as one of the most important series of the year for the Braves, while Milwaukee stands as a proving ground as those two teams would meet in a one-game playoff if the season ended today. Plus, there's this added point of interest for Washington: since the All-Star break, Bryce Harper is hitting .367 with 14 runs in 15 games. Buckle up for what figures to be a massive week for Braves Country. But first, there's plenty to get into as we dive into this week's Three Cuts. 1. Johan Camargo altered perceived in-season 3B plans, but does he alter the offseason ones as well? When the Braves parted ways with Jose Bautista on May 20, general manager Alex Anthopoulos was clear they wanted to find out what they had at third base with Johan Camargo. The numbers, and the way Atlanta approached last week's trade deadline, have told us everything we need to know about how that's worked out so far. Since June 1, Camargo leads the Braves with 34 RBI, is tied with Freddie Freeman with nine home runs and trails only the three-time All-Star first baseman among Braves with 200 or more PAs with a .473 slugging in that span. While the 24-year-old, switch-hitting Camargo struggled immensely against right-handed pitching in 2017 -- he had a paltry 65 wRC+ to go with 190 against lefties -- he's been an above average hitter regardless in 2018 with 145 wRC+ vs. left-handers and 102 against righties. Overall, he's hitting .254/.341/.451 with 15 doubles, 13 home runs and a triple. The defense was never in question. It's been stated multiple times that he's considered the best infield defender in the system, and he hasn't disappointed with a 4.1 defensive fWAR that's sixth in the majors with a minimum of 500 innings and Camargo's four defensive runs saved are tied for ninth with the Rockies' Nolan Arenado and Diamondbacks' Jake Lamb. That, added to the consistency Camargo has shown in both his lefty/righty splits and overall productivity at the plate, allowed the Braves to buck what was one of the surest narratives about this team dating back to the winter: it needed a major upgrade at third base by the trade deadline. With nearly a 2.0 fWAR player manning the hot corner, the Atlanta brain trust didn't have to get into the expensive rental race for the position -- a la Mike Moustakas, who would wind up in Milwaukee -- and instead put their focus on getting incrementally better in the rotation, bullpen and bench. There's still a distinct possibility the Braves could add someone who's been primarily a third baseman by the trade waiver deadline (think the Blue Jays' Josh Donaldson, who is currently on the disabled list and has those Anthopoulos ties going for him). But the biggest win with Camargo -- who many believe is ultimately destined to be a super utility player -- is that Atlanta wasn't rushed into making an upgrade at the spot before July 31 hence spending any of its valuable prospect capital. Whether they'll hold that same position this offseason, either via trade or the free-agent market, remains to be seen with Camargo in place and heralded prospect Austin Riley less than a year away now that he's in Triple-A. There's also the possibility that with shortstop Dansby Swanson struggling at the plate for the second straight year (80 wRC+ after a 66 last season), that Camargo pushes for more time at that spot if the Braves seek an ugrpade at third or turn the keys over to Riley. But those are questions for another time. For now, though, the surprising and complete play of Camargo has at the minimum bought the Braves braintrust time. Or it could show them they've found another building block for the future. The Braves took an understandably cautious approach to improving their roster at the trade deadline, maintaining the high-end pieces in their heralded farm system (more on that later). But Anthopoulos did manage to get better in the three areas he wanted to upgrade: adding a pair of relievers in the returning Jonny Venters and Brad Brach to go along with getting outfielder Adam Duvall and right-handed arm Kevin Gausman in the final 24 hours before last Tuesday's deadline. 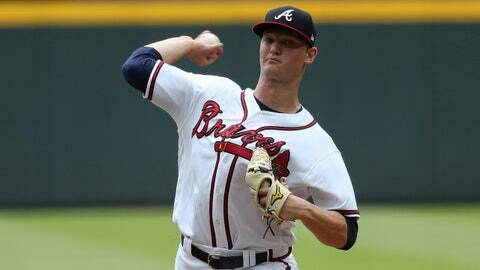 The Braves have seen strong returns so far out of Venters -- one hit in three innings with four strikeouts and a walk -- and Brach -- four strikeouts in each of his last two appearances, including Sunday's win over the Mets, and one his to 13 batters faced over three innings. Meanwhile, it's been a limited exposure to Duvall, who has one hit and a walk with a run scored in five at-bats. That includes one start as a typical everyday player slides into a modified platoon role with Ender Inciarte. But it's the early returns on Gausman that should be of extreme interest as he steps into a rotation that is in need of another consistent piece beyond Mike Foltynewicz, Sean Newcomb and the surprising Anibal Sanchez. Gausman made his debut in Saturday's 3-0 loss to the Mets, throwing five innings with three earned runs, six hits, two walks and a pair of strikeouts. It wasn't overwhelming as, with a Game Score of 43, he delivered an outing that was in the bottom third of his 22 starts. But it was the approach, not necessarily the bottom line results on a day when the Braves had no answer for New York's Zach Wheeler that was so intriguing. In his deadline day interviews, Anthopoulos said they saw something they believed they could tweak with Gausman, the fourth overall pick in the 2012 draft, who has yet to live up to that billing quite yet. The past two-plus seasons, only 14 qualified starters had a higher average fastball velocity that Gausman with his 94.6 mph four-seamer. On the flip side, he ranks 66th in fastball runs above average since 2016 at minus-8.1. It might have been a usage issue as Gausman came in throwing his fastball nearly 59 percent of the time, which was bested by only seven pitchers, yet opponents were hitting .335 against that pitch. But in his first start as a Brave, he threw it 53.5 percent, a figure that was lower in just five of his other 22 starts this season. The return saw it deliver 1.7 wFB runs above average, his fifth-best return of 2018. Gausman supplemented that fastball against the Mets in throwing 8.1 percent changeups, the third-most times he's thrown that pitch all season. In fact, he'd thrown a higher amount of changeups in just 11 of his 127 starts with the Orioles. It may be apropos of nothing considering only Gausman's former team is worse against changeups than the Mets with minus-20.0 wFB, but something to watch going forward as the Braves try to elevate the righty's game as they eye a postseason berth. 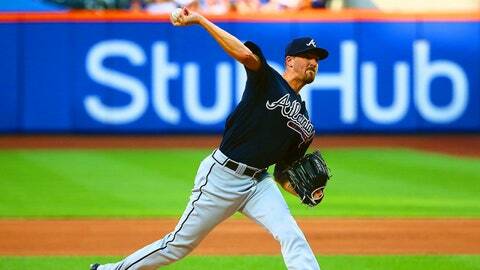 How deep are the Braves at the minor-league level? Ronald Acuña Jr., who opened the season as the No. 2 prospect in all of baseball, has graduated from farm hand status and, yet, Atlanta remains No. 2 in MLB Pipeline's updated rankings of the top farm systems. The Braves lead everyone with nine players in the top 100 in Mike Soroka (No. 15), Kyle Wright (No. 24), Ian Anderson (No. 39), Austin Riley (No. 43), Cristian Pache (No. 57), Luiz Gohara (No. 61), Touki Toussaint (No. 76), Kolby Allard (No. 90) and Drew Waters (No. 98). That's why you can, if your Anthopoulos, you can feel incredibly comfortable moving your previous 14th-ranked (Jean Carlos Encarnacion) and 30th-ranked (Brett Cumberland) players at the trade deadline and have it barely make a dent. 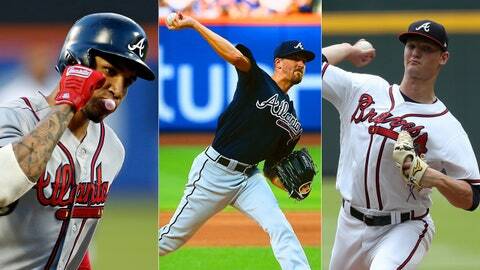 It's also a testament to the growth the Braves have seen, especially from the position players. Riley has jumped 54 spots from the preseason's top 100, hitting .296/.373/.503 across three levels in a season that's seen him miss significant time with a knee injury. Meanwhile, Pache -- who didn't a hit a single home run in his two seasons in the minors, but went deep twice in the exhibition vs. the Braves at SunTrust Park -- has eight HRs and a .286/.311/.431 slash line across high Class-A and Double-A, wasn't in the top 100 back in January. Now, he's at No. 57. But most recently in helping the Braves get to that No. 2 ranking, Waters -- who just moved to the Florida Fire Frogs after hitting .303/.353/.513 with 32 doubles, six triples and nine home runs in 337 at-bats for Rome -- just broke into the top 100 last week with the the A's Franklin Barreto graduating. The strength of the Braves remains their pitching depth, with Soroka looking like a key piece before his injury, we've seen Allard's debut and Gohara bouncing between the majors and minors this season. It's also highly likely we see Wright and Toussaint in Atlanta before the season is up. Riley may or may not join them, with his missed time a factor in his season-long development. But nonetheless, this is the first time since 2009 that the Braves can boast three position players that they either drafted or signed as an international prospect in the top 100 since 2009 when draftees Jason Heyward (10th), Jordan Schafer (50th) and Freddie Freeman (80th) all made Baseball Prospectus' top 100 in 2009.